Before the test begins you can expect the test administrator to provide a thorough explanation of what you will be required to do. For example you will be told the type of tests you will be taking and the duration of each. You will also be given the opportunity to ask any questions you have before the test begins. The test administrator is will try and make the test as fair as possible for all of the candidates. For example, if you mark your answers on the wrong answer sheet then this will be taken into account and you will not lose any marks. You must of course tell the administrator what has happened at the end of the test. Listen carefully to the instructions and if you don’t understand something then ask. If the test is on a PC then make sure that it is working properly. Read the instructions for each question carefully. If you are going miss a question then either guess (if you don’t plan to return to it) or make a mark next to it that you can easily find it later of you have time. Pay no attention to how any other candidate is progressing, you have nothing to gain by knowing whether they are ahead of you and you will undermine your confidence if they are. If you have practiced tests in a structured way you will have developed a feel for your optimum speed through the questions. This is the speed at which you are making the best compromise between progress and accuracy. This is something that you will have learned from experience and that is unique to you. Use this knowledge and do not change your pace even if you feel that you cannot finish the test in the allotted time. If you realize partway through the test that you will not finish: Don’t panic, some aptitude tests are designed to be impossible to finish and you will only under-perform if you deviate from your optimum pace. The only change that you should make is to guess at questions that you know from experience that you find difficult, as this will give you more time for those that you are more comfortable with. If you realize partway through the test that you will finish with time to spare: Do not deviate from your optimum pace but be sure to mark clearly any questions that you want to return to in the final minutes of the test, either to check or to attempt to answer. There is nothing more frustrating than failing to find these questions at the last minute when taking a second to mark them up at the time would make it easy to find them. Psychometric testing can take place at any stage in the recruitment process. Although it is usually used to screen candidates prior to the first interview, it can be used later in the process, for example prior to a second interview. 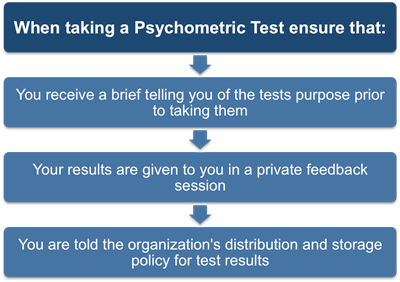 Some organizations apply psychometric testing in ways that are directly relevant to the job. For example, you may only have to take a numerical reasoning test if the job you're applying for requires good numerical skills. However, many organizations use verbal reasoning, numerical reasoning and abstract reasoning tests as a matter of routine irrespective of the precise demands of the job. After they have received candidates resume’s the organization will screen them against the job specification, discarding those where the qualifications or experience are judged to be insufficient. The remaining candidates will each be sent a letter telling them when and where the psychometric testing will take place and what form it will take. The test date is usually set one to two weeks after all of the resumes have been processed. You will usually receive sample questions, so that you have an idea of the type of questions used in the test. This is to ensure that everyone has the opportunity to prepare for the test and that nobody is going to be upset or surprised when they see the test paper. You will usually be told the date, time and place of the test. The format, duration and whether there are any breaks scheduled. The types of test you will be given, any materials that will be supplied and whether the test is paper based or uses a PC or palm-top computer. When you receive this letter, if you have any special requirements you must notify the test center immediately. This would include disabled access and any eyesight or hearing disability you may have. Large text versions of the test should be available for anyone who is visually impaired and provision for written instructions should be made for anyone with a hearing disability. It is perfectly normal to feel some stress and nervousness when you are told that you need to take psychometric tests as part of the selection process. This can be a particular problem if you haven’t taken this type of test before. Most of the nervousness is simply a fear of the unknown and a feeling that you will ‘let yourself down’ and that the test will not be a fair reflection of your strengths and abilities. If you do not act immediately to tackle this stress then its effects will become more corrosive as the test date gets closer. You may experience physical symptoms such as a lack of ability to get to sleep and psychological symptoms such as loss of concentration and mild depression. The job selection process will always involve an element of stressfulness which is mostly due to confronting a situation over which you do not have total control. For example, you cannot predict or influence the personality or behavior of the interviewer or know in advance which questions you will be asked. However you can, and probably have already, prepared for the most likely questions. You can also make educated guesses as to which areas of your resume the interviewer will concentrate on. You will hear a lot of advice for coping with the symptoms of stress and anxiety, including: relaxation, exercise and visualization. While all of these things can help, the most effective solution is to take direct action and spend your time practicing psychometric tests in the most systematic and efficient way possible.